Get the lighting you need to shoot beautiful portraits with this uLite LED 2-Light Collapsible Softbox Kit from Westcott. It bundles in two uLite 500W Edison-style fixtures with two 35W daylight LED bulbs with tungsten covers to provide highly accurate and efficient illumination for your models. Users can choose between both a 20 x 20" collapsible softbox or 26" collapsible octabox to get the exact look they desire. Additionally, two 6.5' light stands are included for support. 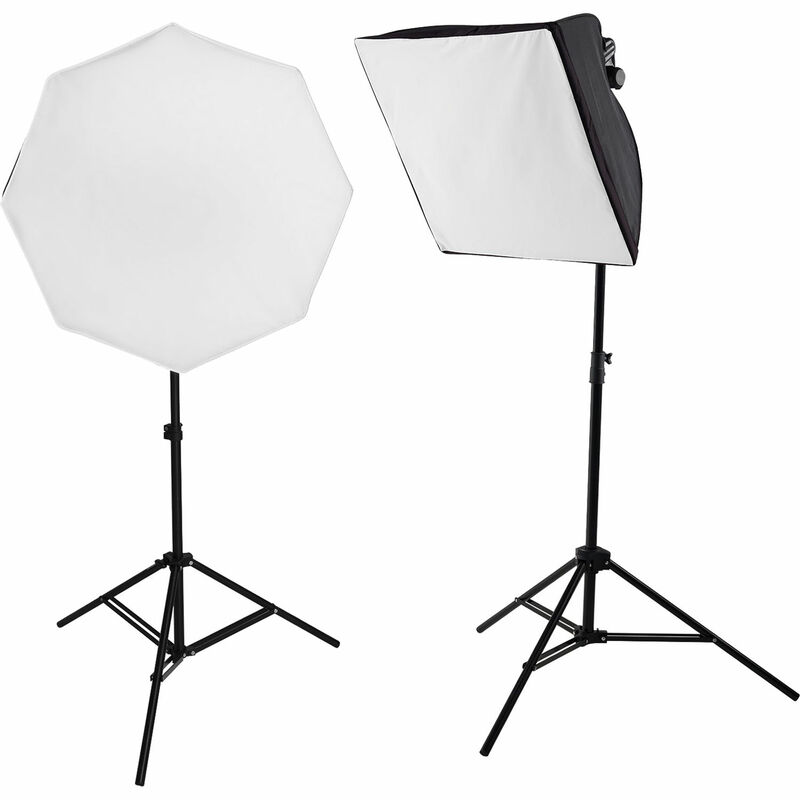 The Westcott uLite Fixture is the basis for several Westcott Kits that add light shapers such as reflectors and softboxes. It is a basic ceramic Edison socket, swivel mount with a Baby (5/8") receptor for a light stand, and a 120 VAC power cord with switch. This is a Westcott PhotoBasics uLite 20" Softbox. 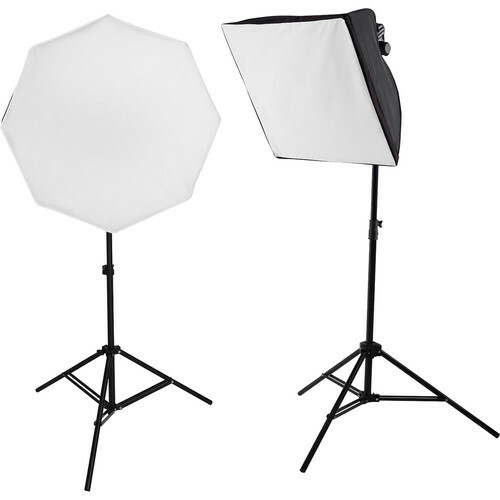 This 20" square collapsible softbox is designed specifically for the uLite fixture (available separately). It sets up in seconds. For use with the Westcott Basics uLite, this uLite 26" Octobox produces a soft and evenly diffused light output. It sets up and tears down quickly for convenience. Featuring a reflective silver interior, this octobox's deep profile creates a large light spread and a round catchlight in your subject's eyes. The uLite Octabox is rated for use up to 500-watts and includes an easy-to-use diffusion front. The 35W Daylight LED Lamp with Tungsten Cap from Westcott is an Edison-based light source with 64 LEDs that render colors faithfully, earning their high CRI rating of 95 and TLCI rating of 91. The lamp comes with a removable cap that instantly converts it to tungsten balance. The lamp is made up of 64 bright light emitting diodes rated for over 20,000 hours of use. It's able to render accurate skin tones with a 95 CRI rating and, although daylight-balanced, can be changed to warm tungsten balance with the included snap-on cap. This 6.5' Westcott Light Stand is usually sold as part of a Photo Basics or Spiderlite lighting kit. Box Dimensions (LxWxH) 8.2 x 4.8 x 4.1"
Box Dimensions (LxWxH) 19.0 x 5.0 x 5.0"
Box Dimensions (LxWxH) 9.5 x 8.0 x 2.0"
Box Dimensions (LxWxH) 6.85 x 3.85 x 3.85"
Box Dimensions (LxWxH) 28.2 x 3.55 x 3.15"
We'd recommend calling Westcott's customer service and they will provide the most appropriate answer for you. They can be reached at 419-243-7311.